This week on the Healing Pain Podcast, I had the privilege of interviewing Professor Lorimer Moseley. Whether you’re a practitioner or a patient, you may very well be aware of his work, as he is one of the global leaders in the revolution to change the current paradigm around chronic pain. 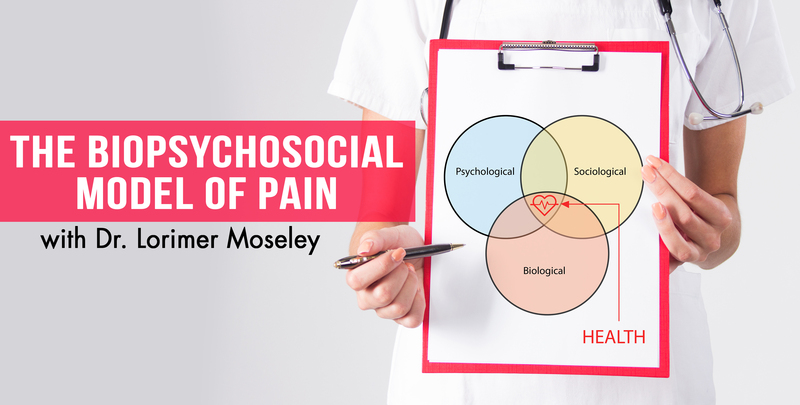 Professor Moseley is a Clinical Scientist investigating pain in humans. After posts at the University of Oxford and the University of Sydney, Lorimer was appointed Foundation Professor of Neuroscience and Chair in Physiotherapy at The Sansom Institute for Health Research at the University of South Australia. He’s a Senior Principal Research Fellow at NeuRA and an NHMRC Principal Research Fellow. He has published over 280 articles and five books. He has given over 140 keynote or invited presentations at interdisciplinary meetings in 30 countries and has provided professional education in pain sciences to over 15,000 health professionals as well as lectures to the public. He consults to both government and industry bodies. He was awarded the outstanding mid-career clinical scientist working in a pain-related field by the International Association for the Study of Pain, was a runner up for the 2012 Australian Science Minister’s Prize for Life Sciences and won the 2013 Marshall & Warren Award from the NHMRC for Best Innovative and Transformative Project. He was made a Fellow by the Australian College of Physiotherapist in 2011 and Honored Member of the Australian Physiotherapy Association at their highest level in 2014. Today, we spoke about the biopsychosocial model of pain and he describes it in his words. We took a mini tour of psychologically performed physical therapy practice and how a practitioner can develop psychoeducational programs for their patients and contrasted some of the key differences between Explain Pain; CBT, which is Cognitive Behavioral Therapy and ACT, which is Acceptance and Commitment Therapy. It was a great lecture and a great talk with Dr. Moseley on the podcast. Make sure to share it out with your friends and family on social media. Dr. Lorimer Moseley, welcome to the Healing Pain Podcast. It’s great to have you here. I’ve been spending the better part of the day trying to figure out how I can come back into the conversation of pain with you as you’re one of the most highly and sought after pain experts in sciences probably on the planet at this point. 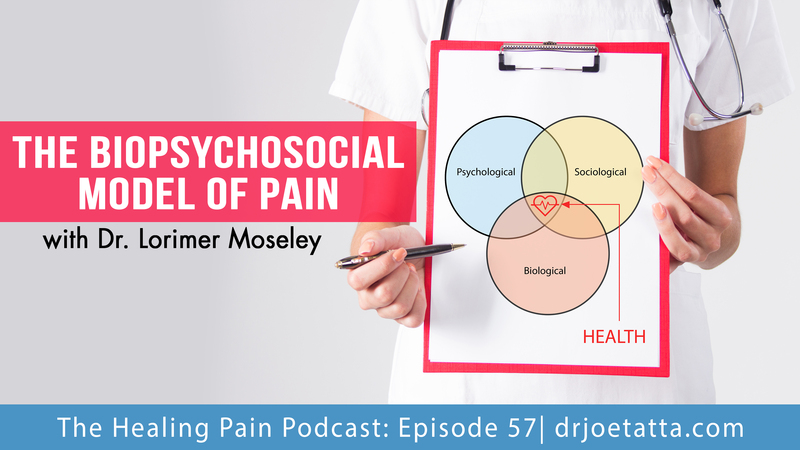 I think the best place to start is your definition of what the biopsychosocial model of pain is and why it’s so important for both practitioners and people who are looking for the solution to their pain. The human experience is modulated in real time and potentially powerful by things across biological domain. My definition is only one that’s been informed by others. It’s not like I have any original contribution to that space. When I think of the biopsychosocial model I think of it applying to the human and maybe it applies to other animals. The human experience is modulated in real time and potentially powerful by things across biological domain. By that, I mean things that we can quantify within the body, psychological domains and social domains. I guess I would capture the last two as contextual. I will now make up a term called the biocontextual model because I think context captures those last two. It’s a really tricky term now. I do think it’s not understood to be the same thing across the planet, even within reasonably homogeneous groups of people. A lot of people would understand biological to be the things that are real and psychosocial to be the cues that exist out in the periphery. My view is that any psychological event or any social event is only an event because there’s a biological involvement and substrate to it. It is slightly problematic. Does that give you an idea of how I understand it at least? It does. I think it gives me an idea of your perspective on it. Throughout this podcast I’ve interviewed many different people. I think it’s become this catchphrase now that people are just throwing it out there. It’s almost like saying the word cheese with dinner. Cheese just comes on the plate with your salad and it’s known to be there. I think everyone has their different view of what it is and maybe that’s the beauty of it because every patient in front of you is different and how you apply that model to your patient might be different as well. I think it also brings challenges, the diversity and understanding. When I say to someone, “Do you use a biopsychosocial model to guide your practice?” I don’t know that they understand that to be the same thing that I understand it to be. I do think that to me, it’s not really the biopsychosocial model, it’s a psychosocial model. The people who don’t like the biopsychosocial model are normally people who think, “I like the biological model.” I think that’s missing the point. George Engel’s work on this still remains in my mind that is the best on it. His papers from the 60s and 70s where it was really novel, which is remarkable considering where we’ve come from as well. The ancient mystics were pretty biopsychosocial. George Engel really, really was elegant and eloquent in his articulation of why we need this biopsychosocial understanding. It was all about the human, the experiencer. I think we often tend to try to implement or to integrate the biopsychosocial model into us as the deliverer of something. I think it should always be the experiencers. The focus should be on the experience, if that makes sense. I had Dr. Steven George on a couple of podcast ago, who you may know he’s got some great research in some of the physical therapy journals around what he calls psychologically informed practice or psychologically informed physical therapy. In addition to your research, you’re also known for something called Explain Pain intervention that helps people and helps people with their pain, helps clinicians begin to explain the bio as well as the psycho and the social that’s going on. How does Explain Pain fit into this psychologically informed practice that we’re moving toward? Well done on getting Steve George in. He’s a really impressive operator and does great work. My answer to that question is that it might be helpful to explain the history of my interaction with explaining pain. As a clinician in the early 90s, I think I observed that the most effective thing I was doing was giving people an understanding of what their experience meant in terms of what we currently understand about biology. You mentioned about as well as my research, I have some reputation for this explaining pain thing. 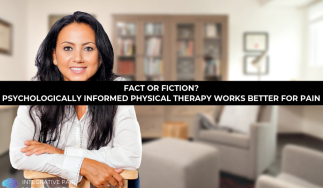 I always like to pounce on that and say, “That was my research for a fair amount of time before it became anything.” That sounds like nothing but I think that’s really important in the physical therapy field and probably beyond the physical therapy field. We’ve got a pretty poor track record of promoting interventions before we research them, right down to entire religions of clinical frameworks that were never tested. Now that we’re testing them all in the last decade or so, we’re realizing they’re not doing what we thought they were doing and we’re mainly rushing to retrofit theoretic frameworks and stuff like that. That’s a really slippery slope in my view. I always pounce on the opportunity to say we did run a bunch of trials on this before we told anyone it was a good thing to do. That’s how it should be done and I hate to say I’m self-righteous, but I think that’s really important for our own credibility but also because the human needs are complex and is so biopsychosocial. We can do anything and if the clinician believed in it, it would have an effect. We got to be careful of that. Your question was about how this explaining pain biology fit in with psychologically informed physical therapy or PT. I think it’s a critical dovetail. I think that the motivation was that the people were hearing what was dominant psychological practice for pain management in the 90s, which could be externalized with the phrase, “It hurts but you’re not being harmed.” It doesn’t make no harm, you can move despite your pain.” We had some great strategies to do that and we have a lot to thank the psychologists for that. What I observe was that people would come out of a three-week biopsychosocial psychology-driven type program believing that they were the only one in the group with real pain. Everyone else in the group thought they had pain but they didn’t really have pain because why would they be in a pain program, which is for people who think they had pain when they don’t. It’s fundamental miscalculation and misunderstanding. That’s when I started saying, ” We know you’ve got real pain. We know they do and we also know that it’s not explained by an injury. Do you understand the difference between those things?” That’s where it all started. I think the psychologically informed PT in my mind only makes sense with an understanding of the biology of the human that allows for biopsychosocial experience or organism. There’s structural pathology of understanding pain and understanding pain as a transmitted thing through virtual hardwired pathways, which is still a strong model. It makes no sense to have psychologically informed PT if that’s how the system works. That’s just why? Why would it matter if you’re using cognitive behavioral principles in what you’re doing if pain is about tissues of the body? Then you just work and repair them or identify or cut them out. I actually think that psychologically informed PT is really only justifiable on an accurate understanding of the biology of pain. Until everyone has that as the default, psychologically informed PT will not go down very well. I think it’s important to understand why. That will be my view. When I first came across your work, and I have a lot of friends who are psychologists that I respect, I started describing it to them. They said it really sounds like a version of Cognitive Behavioral Therapy. I wasn’t quite sure how to answer that. I have an idea of how I might answer it , but I’m curious to see if you could shed some light on it. I feel over time as a profession, we’re getting more comfortable saying that definitely there is a cognitive and a behavioral aspect of what I do as a physiotherapist or as a physical therapist, and it’s okay that I bring that skill set into my toolbox when I work with patients. I’m very interested in what your answer would be as well, Joe. I think that education has been around for longer than CBT has. Education is a cognitive targeted strategy. In that sense, it comes on to that same banner, but it’s certainly not the same as all the cognitive and behavioral therapies that have been used for pain. In fact, that had been tested in RCTs that are broadly considered “CBT.” CBT in the pain field has been about how to manage your pain and how to limit its impact on your life. I would argue exactly the same as I’ve just argued about psychologically informed PT, that actually the trigger for explaining pain was that CBT has made no sense to patients. Whether it’s appropriately categorized under a CBT or not, it probably is, but in my view the implementation of a range of strategies to change someone’s concept has been around since the mystics. The people of my country have been educating their children through what we now know as effective conceptual change strategies for 60,000 years. It’s a long time before CBT. I’m not at all trying to trump it on the time thing and say that’s why it’s not a CBT. I just think it’s important to see the difference. I think that even the really hard profile, academically successful in pain areas psychologists now I’m sure would say they didn’t understand the biology. They really did think that pain was unavoidable and suffering was optional so we’ll use CBTs to reduce suffering. I think that’s a known statement according to biology. What’s your answer to that, Joe? My answer really was, I think this has evolved over time, but I believe that physical therapists in many ways have been instituting concepts of cognitive principles along with behavioral. An exercise intervention is behavioral. I think we’ve all been doing that in some ways since day one. Did we know we were doing that probably twenty years ago when I graduated school in 1996? No. To be quite honest with you, I’d probably wouldn’t really even think of the term then. I don’t know if now the information is travelling so much faster or it had shown up in the literature or it had shown up on the internet. I think most of us now have accepted that there are seedlings of psychology in almost every interaction we have if you’re applying the information such as something like the Explain Pain, the physiology of pain or the biology of pain in a way that is trying to help your patient. We can’t have the interaction. I think the only health professional who could have that interaction would be the health professional dealing with an unconscious patient or making a patient unconscious. Even an anesthetist whose job is to knock them out has a psychological interaction before that happens, “I can do that in lots of different ways.” It’s a psychological interaction. It’s relationship. I appreciate your question because I’ve actually had to reassess myself as a professional. I call them psychoeducational approaches, which I feel is a word that is also more approachable for patients. Oftentimes when you tell patients about psychology, they take it somewhat as a negative in their life. I’ve actually started to embrace that and there are times when I won’t do exercise, I won’t do manual therapy, it’s just more of that psychoeducational intervention during a treatment session. There are other times where I really like to see that throughout the session and I feel that’s most effective and of course, it depends on the patient. Do you see the evolution of this type of intervention, whether you call it Explain Pain or psychologically informed practice? Do you see eventually that a therapist may run a type of cognitive behavioral group and just to explain pain for a couple of visits before they intervene with the more traditional manual therapy and exercise? My encouragement to those people is to not explain the effects of manual therapy in a way that we now know is inaccurate. That’s happening, Joe. That’s reasonably common now in some places. I can think of a handful of clinics in Adelaide where I live, in Melbourne and Sydney. That’s the structure. Everyone participates in the Explain Pain type thing and it’s very psychologically informed PT practice. Some of those incorporate manual therapies. My encouragement to those people is to not explain the effects of manual therapy in a way that we now know is inaccurate. Not to tell people, “I’m putting your disc back in” or “I’m realigning joints,” because that’s not true. But they might be giving great pain relief through perturbations in the nervous system. How cool is that? “There’s analgesic in your system ready to be exported. I think that’s really cool explanation. That model that you’re talking about, that’s happening. It’s probably happening less in the US because you don’t have a reimbursement structure that allows for it. That’s a challenge here as well. It’s hard for these clinicians to make it a financially viable thing to do, but that’s a process that’s changing. The policy people are starting to introduce codes that incorporate Explain Pain or a couple of the workers’ comp boards now have a code for the actual resources of Explain Pain so they’ll reimburse for that. It’s a slow moving but nonetheless not stationary field. Professors know this as black flags where we have a reimbursement system here in the US that even though reimbursement system, for PTs anyway, it’s stuck in the biomedical model. When we start to talk about these psycho-educational interventions like Explain Pain and you look at our codes, nothing fits. In a way even if you love it, they’re always this potentially depending on where you work and maybe administration saying, “I don’t know how we can charge for this.” You brought up the importance of language and languages spoke about in Explain Pain and has also spoke about in ACT, Acceptance and Commitment Therapy, which you know about. Can you talk about why language is important and without maybe diving into ACT because it’s not really the focus of our podcast, how is it different? Also, I’m not an ACT expert by any means. I have a pretty basic understanding and experience of it. First part of your question was ,how is it important? I think it’s as important as anything can be because it’s the units on which we attach meaning and by which we can alter meaning. I reckon that pain is all about meaning, and many would argue life is pretty much all about meaning. I’m not sure if I’d go that far but many would argue that. How is it different to ACT? That’s a hard one for me to answer because of my pretty cursory knowledge of ACT. How is it important and how this might be relevant to ACT is that there is a really strong argument if we want to engage with anyone, we need to “speak their language.” We need to learn their language and we can also integrate some pretty cool science on what subtypes of that language promote belief or vision and behavioral responses and what subtypes don’t. The literature and science on suggestions and suggested language, hypnotic language, motivational interviewing, bodies have researched are really useful to us, really useful. I’ve greatly appreciated the interactions that I’m having now in a collaborative way with Mark Jensen from Seattle. The way that field has established better and worse implementations of language to promote belief or vision and may have different phrases, openness to change and these things and how to have real neurological effects in the brain. My understanding is that ACT also incorporates that background knowledge. That’s just far as I would go comfortably comparing the two. It’s interesting because when I’ve read books on ACT and studied it, they have talked a lot about the aspect of human suffering. When I first read about it, I thought it was really interesting because I feel that in some point, people have to become present with that suffering to address what needs to be addressed in their life. Oftentimes these are lifestyle approaches that we’re educating people about to help them with their pain. The place where I feel that as a PT, because I think we’ve been trained so much to fix things, is I think ultimately a patient really does want pain relief. ACT really doesn’t quite go down that road because they say, “There’s always suffering in life. 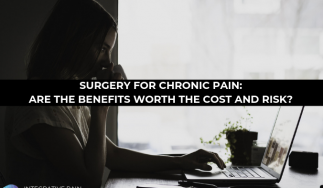 If you have a chronic disease, this may be your path.” If I read into your literature correctly and at some of your information, it seems like eventually you want to move the patient to be pain-free and I think that’s what people really want as well. I think I would concur with all of that, Joe. That’s probably a point of contrast between where ACT has come from and Explain Pain. I don’t think that when people are pain free, they’re not suffering free. I think that those principles of ACT will apply to people who are in pain and people who are not in pain. I think that ACT, in my cursory knowledge, it feels a lot like what my cursory knowledge of Buddhism tells me. Buddhism is values based, acceptance and commitment to process variables rather than outcomes necessarily. I don’t think that what I see to be the reality of the biology of pain and that is that we are bioplastic. The brain will stop somebody hurting if it thinks it doesn’t need protecting, that’s what I believe. I think that ACT does come short of that. However, I also very much value a relationship I have with Kevin Vowles who is an ACT guy. He and I and David Butler went out with him and I wrote Explain Pain and Explain Pain Superchargeand all that stuff. He really is a rock star in the field, David. He’s as good as anyone, for sure. The three of us integrated really well in a three-day course on integrating Explain Pain and ACT. I think that ACT, like anything else, has people who interpret and implement it in different ways. Kevin’s journey and his implementation is really powerful because it shows me that ACT doesn’t actively contradict the biology, it just doesn’t really go into it. If we did go into it, I think a lot of people practicing ACT would think, “Maybe pain is not something that will necessarily be around forever.” That’s a great thing to watch, to see people make that shift and then their clinical practice explodes again in a really positive way. It’s great to witness that. There are two points in your newest book, Explain Pain Supercharge, I thought were really fascinating. I’m glad you wrote about them or talking about them, and I want to bring them up. The first is the concept of xenobiotic molecular patterns. You also make mention what are xenobiotics and you make mention as opioids being a type of xenobiotic. I think with the opioid epidemic that we have in the US as well as globally, can you shed some light on what you meant by that and why it’s important for people to understand? That’s not mine by any means, nor David’s. That work is pretty mainstream all out at the leading edge of neuroimmunology. That phrasing is something that it is published and I think we referenced those papers. Most of my learning has come from a guy called Professor Mark Hutchinson. He rather modestly describes himself as a pharmaco-psycho-neuro-immunologist or something like that. He’s an outstanding scientist and an outstanding fellow who denies being a clinician but really does have great insight into the human experience. His work is on this stuff and it’s very well understood. It’s well understood that opioids have a neural interaction to have an antinociceptive effect on opioid-based pathways as a neurotransmitter. Equally it activates toll-like receptors on immune cells, which upregulate the inflammatory set point at a synaptic level. I think in Explain Pain Supercharge, we worked really hard to capture some pretty high end neuroimmunology and neurophysiology in a way that was graspable and our results suggest that we did a pretty good job of that. The interested reader possibly like you, Joe, I would now say should go to Explain Pain Supercharge and then beyond if you really want to get a handle on it because we simplify it. When I do courses on this, I talk about on the body of an elephant as a toll-like receptors. The concepts as we present them are pretty simple but the underlying biology is terrifically complex. There are very clever, motivated and well-funded researchers untangling this and that’s an exciting time from a comprehension perspective. There’s so much information moving that. It’s difficult to keep up with at times. The other thing you mentioned about in the book is an immune set point in the body. You were starting to talk about the interaction between the nervous system and the immune system and this balance between a pro-inflammatory state and anti-inflammatory state, which all of us are constantly going through. How does Explain Pain, the psychoeducational intervention, influence this balance in our body? For example, learning new data in animal study is anti-inflammatory. The precise answer to that is we don’t know. However, if we were to predict on the basis of what we do know, what would happen, there are several things that are relevant. For example, learning new data in animal study is anti-inflammatory. The spatial data associated with learning also maintains a sustained anti-inflammatory effect. In the animal model, if the animal learns something cool on a certain location in the maze, that location in the maze potentially becomes an anti-inflammatory location. I imagine that’s about cues of different sorts and even that is an extrapolation of data. To extrapolate it to humans, that’s a big extrapolation. If I was to talk more maybe ideologically if that makes sense, I think there’s very good evidence to say that explaining pain is anti-threat. 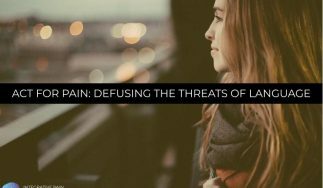 We could argue that anti-threat is anti-inflammatory and explaining pain I would describe as a big sin in the language of the Protectometer. A big hit of safety cues when understanding and appreciating a lot can do something about this. I have some skills to do it and it makes sense, why is pain worse with this people or with these different cues? Then anything that is anti-threat is not just about feelings like pain. It’s about all of our protective mechanisms and one of our protective strategies is to become inflamed. To go back to the precise answer, we don’t know. The predictions are that it should be anti-inflammatory. I do like the aspect you bring in that Explain Pain makes you feel safe or makes people feel safe if it’s done correctly. That makes me think about the definition of pain where it’s both a sensory and emotional experience. In many ways, what you’re saying is this type of intervention starts to impact or affect someone’s emotional experience around their pain. It should. I’m really interested. One of my past students, Kerwin Talbot, who’s just submitted, one of her studies was to look at this distinction between the two aspects of pain: the sensory and emotional. On the basis of that really good work, it’s a unitary experience. As researchers, we try to split those two things. I think the response might reflect our training more than actually being two distinct aspects of pain. In my view, pain is sensory and emotional. It’s an unpleasant feeling felt somewhere. I find it hard to disentangle those things without compromising the wider unitary experience. In the spirit of your question, understanding something and knowing you know what to do about this massive safety hit of Explain Pain done well, it should reduce pain and therefore reduce intensity and unpleasantness. You’ve probably done research, is that the catastrophizing that you think it targets first and foremost? I did think that, but Hopin Lee, who is PhD in our group and now is a post-doctor, I think he’s on his way to Oxford anyway, an outstanding researcher, did some really cool data analysis of ordered data. We’ve got data from now almost 2,000 patients who’ve been through Explain Pain. We asked the question in Hopin’s study whether a change in catastrophizing mediates the effect of a change in knowledge on pain. To say that in another way, when you explain pain effectively, does its effect on pain happening because you reduced catastrophizing? The answer to that analysis is no. It’s not the mechanism. The most conservative analysis we could do, the conclusion would be, it’s certainly not the only mechanism. When we really analyze it robustly, it doesn’t come out at all in a big data set. If we are a little bit less conservative, then it might be contributive but it’s not the only contributor. In fact, Hopin also did a really interesting mediation meta-analysis on other studies that are non-Explain Pain studies which show that changes in self-efficacy and fear did seem to mediate effect on disability of interventions but not so much to changing catastrophizing. Really interesting and sparked a bit of pretty vigorous debate between our group and the catastrophizing body who have done amazing work. I think the jury’s out on that. I think Hopin’s work is outstanding but it’s opened up a new avenue of mediation studies. We’ll know in maybe five years. That’s really interesting because I think that catastrophizing, a lot of therapist especially have grasped on to well because it had been in the research, it had been in the literature, people have written books on it. It’s fascinating to hear that you figure out that’s probably not treating that directly and that it might be something else. What I currently reckon is the situation is that catastrophizing is important but probably not as important as we thought. It’s been fascinating having you on the podcast. Where would you like to see your work go in the next five years? We talked about the clinician aspect of that or the research aspect, or they just blend into one for you. I often get asked this question and I always feel so conscious answering it and feel like I’m letting the interviewer down by this answer. I just want my work to resonate with my values, and it does. It always has and I’ve made intentional choices to make that happen. The most honest answer to that question is that I hope in five years, I still feel this is good, what I’m doing. I’m true and I’m authentic in this space and I’m doing it for the right reason. I sleep well at night. If I was to think about what I imagine might not happen on that path, and I tend to look beyond the next year unless I’m committed to a grand project that will last longer than that. I don’t really think much beyond today. I’m really excited at the moment about some of the progress we’re making in mass reconceptualization, in the planning and development and testing of short shock conceptual change strategies. Once we know they’re good, presuming that we will find that out, we can spread the word and start to use grassroots people to change the practice of their clinicians. When they turn up, they ask questions that their clinicians can’t answer unless they’re informed. I think that’s a really exciting time to be doing that. The test we’re doing on a couple of little videos we’ve done are really exciting. Imagine in five years, we’ll be able to measure something at a mass level. That means that things are still shifting and what I think at the moment is the right direction. I want to thank Dr. Lorimer Moseley for being on the Healing Pain Podcast. Make sure you share this information out with your friends and family. It’s great information whether you’re a practitioner or you’re someone looking for solutions to the pain. Can you tell us where everyone can find that more information about you, Lorimer? We have a research group website called BodyInMind.org. Our research group alone, we now draw research from all over the place. We have a research group website called BodyInMind.org. Our research group alone, we now draw research from all over the place. We just try and source it and convince people to write blog post and we help them write them. I think that’s a good thing to follow if you’re a clinician or a clinical scientist in the pain field then BodyInMind.org would be good. The books that we’ve written, you can get them through NOI group or OPTP. If you do want to know more about me probably Google that, but I’m not the thing. The content on that field is the thing. Thanks for having me, Joe. It’s been nice to chat. I want to thank everyone for joining me on the podcast this week. I’ll see you next week. He has published over 280 articles, five books and numerous book chapters. He has given over 140 keynote or invited presentations at interdisciplinary meetings in 30 countries and has provided professional education in pain sciences to over 15,000 medical and health practitioners and public lectures to 35,000. His research group outreach videos and articles have attracted over 4 million views/reads. He consults to governmental and industry bodies in Europe and North America on pain-related issues. He was awarded the inaugural Ulf Lindblom Award for the outstanding mid-career clinical scientist working in a pain-related field by the International Association for the Study of Pain, was runner up for the 2012 Australian Science Minister’s Prize for Life Sciences, and won the 2013 Marshall & Warren Award from the NHMRC, for the Best Innovative and Potentially Transformative Project. He was made Fellow of the Australian College of Physiotherapists in 2011, by original contribution, and an Honoured Member of the Australian Physiotherapy Association, their highest honour, in 2014. In 2017 he was received a Doctor of Science in 2017 for his contribution to the field, and was made Honorary Fellow of the Faculty of Pain Medicine, Australia New Zealand College of Anaesthetists, the second allied health professional so honoured. The biopsychosocial model of pain looks at psychological, biological and social factors as the cause of experiencing pain. Chronic pain patients often claim that the pain interferes with their work or social life. This interference only solidifies their feelings of being isolated and can lead to depressive thinking. These feeling, in turn, can make the pain seem worse. Professor Lorimer Moseley is a global leader in chronic pain treatment and research. He has been appointed the Foundation Professor of Neuroscience and Chair in Physiotherapy at The Sansom Institute for Health Research at the University of South Australia. Dr. Moseley has published numerous articles and books, given lectures across the world and educated thousands of health professionals, consulting with both government and industry bodies. It was a great lecture and a great talk with Dr. Moseley on the podcast. Make sure to share it out with your friends and family on social media. However, I also very much value a relationship I have with Kevin Vowles who is an ACT guy. He and I and David Butler went out with him and I wrote Explain Pain and Explain Pain Supercharge and all that stuff. He really is a rock star in the field, David. He’s as good as anyone, for sure. The three of us integrated really well in a three-day course on integrating Explain Pain and ACT. I think that ACT, like anything else, has people who interpret and implement it in different ways. Kevin’s journey and his implementation is really powerful because it shows me that ACT doesn’t actively contradict the biology, it just doesn’t really go into it. If we did go into it, I think a lot of people practicing ACT would think, “Maybe pain is not something that will necessarily be around forever.” That’s a great thing to watch, to see people make that shift and then their clinical practice explodes again in a really positive way. It’s great to witness that.